Few things lead to frustration quicker than when you need to print something in a pinch, and your printer doesn’t want to cooperate (and it won’t tell you why either!) While streaky lines across your images or faded text is one hassle, dealing with a printer that won’t even acknowledge you exist is another. Whether you’re getting an error message that doesn’t sync up with reality or your printer is giving you the silent treatment, knowing where to start when your printer won’t print can relieve some of that frustration. Specific troubleshooting solutions will vary depending on your printer model, but once you understand some common issues, you can quickly search and find fixes specific to your unit. Manufacturers offer online resources to help you work through your most troubling printer issues and we’ve got some basic tips covered right here! When your printer says that there’s a paper jam, and there isn’t, chances are it’s because there’s a mechanical problem afoot. Don’t immediately smash your printer in a field though! In searching for a solution for a ghost-jammed HP® printer, Neal Poole discovered that often real paper jams could leave residue behind that interferes with printer operation long after the jam is gone. Remove the rear duplexer and grip any of the four rollers. Do they move freely? If no, your next step is to . . .
Touch two of the brass contact points with a paper clip. Bridging this contact makes the printer think the duplexer is still installed, and you’ll want to maintain this contact all the way through the final step. Press OK on the control panel. Take a look at the white plastic gears on the left-hand side. Do they move freely, or do they stall, skip, freeze, or jam? If it’s the second scenario, you have paper shards, which you will need to clear from the gears. Grip the furthest rubber roller and rotate. Check for shards of paper in the gear teeth. Once the rollers and gears spin freely, you’ve cleared the ghost jam, and you can remove the paper clip and reassemble. 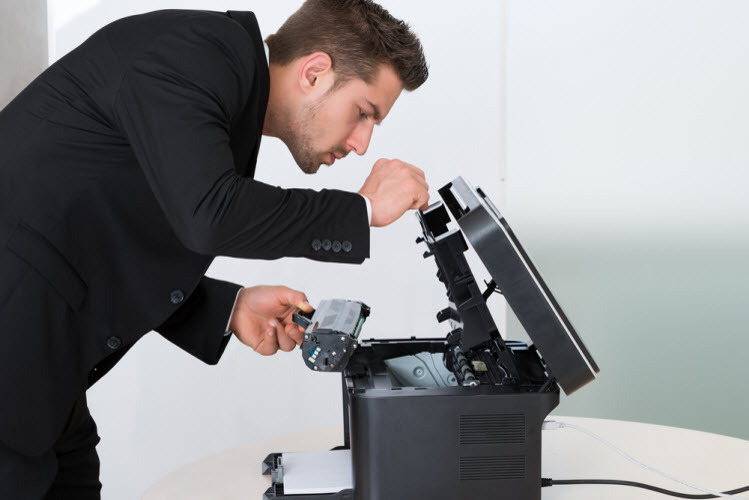 Unplug your printer to reset the sensors if you are still getting a paper jam notice after cleaning. Hardware isn’t always to blame. Your printer driver acts as the translator between your computer and your printer. Like other software, drivers can also go out of date, or lose compatibility with your operating system after an update. You may also have the wrong driver downloaded on your computer to work with your printer. Uninstalling the driver you have on your desktop, then replacing it with an up-to-date version, often will get your printer and desktop chatting again. When your print job finishes, your queue is supposed to clear itself automatically. That doesn’t always work out as planned, especially when some print runs are put on hold, postponed, or stopped due to data connection issues. If your queue gets all blocked up, it can cause your driver to grind to a halt. Often, in an attempt to print something, you’ll end up selecting print several times over, further overloading your queue. A side note: this is explicitly for the HP printers paired with Windows, but the general principles apply across printer models and brands. Turn your printer off completely and unplug it from your power source. Be sure to save the document you are planning on printing, in the form you want it printed. When you clear your queue, all print jobs that haven’t saved will be erased—it will disappear as well. Open Windows Services by searching “Services” in your search toolbar or clicking the Window button on your keyboard. Halfway down your list of Services, you’ll see one called the “Print Spooler.” Right click on the Print Spooler option and look at your options. “STOP” will halt any stuck print you have bogging down your queue. Delete all existing files in your queue and shut down your computer unit from Windows. Turn on your printer using the power button, then turn on your computer again. Print your document. If it works, you’re done! If your print queue gets bogged down and freezes again, you have a couple of other options. HP offers a free software called HP Print and Scan Doctor which you can download for free. Running this program will automatically troubleshoot common issues with your printer and resolve them. If you are still having trouble with your queue jamming, uninstall and update your printer driver. Sometimes, an older driver may not be compatible or can corrupt, which will prevent your prints from processing. Wireless connectivity is a double-edged blade. 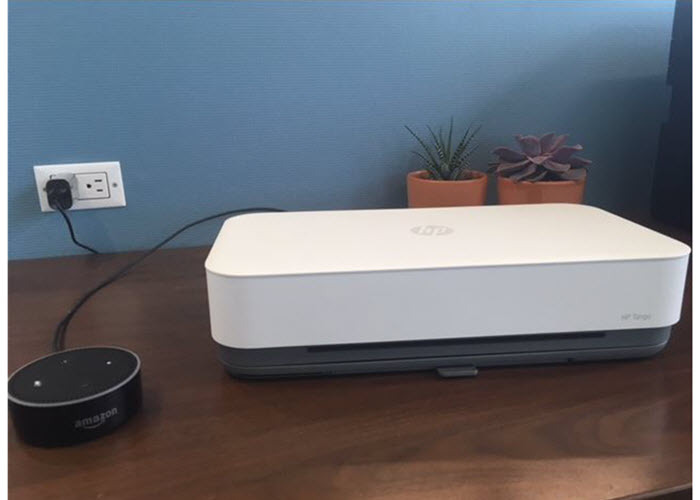 On the one hand, you can connect your printer to devices anywhere in your home. On the other, your connection is something that you can’t see. 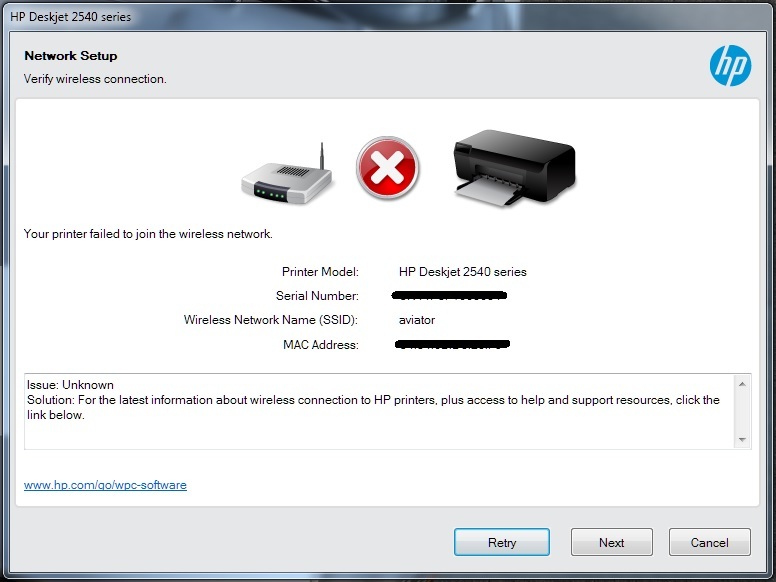 If your printer has dropped its Wi-fi signal, often you won’t be able to tell unless you troubleshoot the connectivity. If your printer’s Wi-fi is down, unplug it and reconnect it to your modem. It’s a bit of a trope these days, but powering down electronics can do wonders for fixing problems. If your device isn’t connecting to your printer, check to see that your Wi-fi and Bluetooth capabilities are up and operational. A weak (or nonexistent!) connection between your computer and printer will prevent you from getting the documents you need. And because the issues lie between the two, often it can be tough to diagnose. If your printer was connecting wirelessly to your printer and then stopped, try restarting your computer and printer to see if they will reconnect. If no, here are some common questions you should ask when you suspect your WiFi connection may be to blame for your issues. Is your printer connected to your network? Printing a Wireless Network Test Report is the easiest way to check and see on HP printers. Go to your control panel and select Wireless Network Test Report (on some models, you can access this directly by hitting the wireless button). This report will give you insights into connectivity, the units connected to the network, and the Network Name (SSID address)—from which you can see if your unit is connecting to the network. Consider restarting your router and printer to reconnect. Is your computer connected to the network? 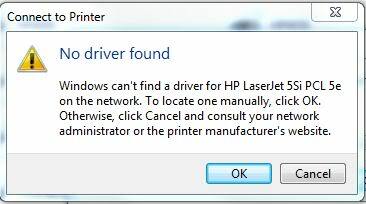 For Windows users, select the HP Print and Scan Doctor discussed above to check. For Apple users, click on the Wireless logo in the top right-hand corner of your screen. Is your network checked? Was anything on your computer changed recently? Updates to your security software, firewalls, browser, and operating system can result in connection issues with your printer. You may need to reconnect your computer to the network, reconfigure your protection settings to include printers, or install an updated driver, depending on the nature of your updates. If you updated software, consider restoring your system back to the original settings/version to see if that reconnects you. Was your router replaced recently? Chances are you’ll need to reconfigure your printer and computer to reconnect with the network. Check to see if your new router is assigned a different ISP address, which will need reconfiguration. Everyone wants to enjoy the convenience of being able to print directly from their iPhone®, iPad® or Android® mobile device. But wirelessly connecting your printer and device can be complicated, and the process will vary from brand to brand. Even if there’s an app for your printer brand, differences in software could prevent you from connecting directly. Make sure that your WiFi is properly working if you are having difficulty connecting, using the process outlined above. If your wireless printer connection isn’t functioning smoothly, downloading different apps or deleting existing ones won’t help. Select the app you want to print from, and tap the “Share” icon (HERE) or “Settings” icon (HERE). Most troubleshooting for AirPrint that doesn’t stem from WiFi glitches come from compatibility issues. Not every app is AirPrint ready, and while AirPrint is becoming more common with newer WiFi printers, not every model comes pre-loaded. Double check your users manual to make sure your printer is compatible. If not, there are other easy ways to connect your Apple products to your printer wirelessly. Print Apple for Non-Airprint Printers. 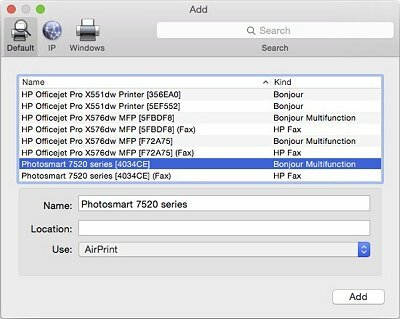 Connecting Apple products to non-AirPrint printers isn’t difficult, once you have the necessary tools. Printer Pro is a budget-friendly app downloadable via the App Store for $4.99 that acts as a bridge between your devices and printer. Login to the App and select the “Add Printer” option on the bottom left-hand side. Your select printer page provides an option to automatically connect to a networked printer or manually add an IP address. Choose the option to print a test page and confirm that your settings are correct. If your print isn’t clean, double check your firewall settings to make sure your security isn’t interfering with data transfer. Your test page will also allow you to make sure your print is properly calibrated. If you’re having problems automatically connecting via Printer Pro, double check your IP address and make sure it matches up. Also, make sure that your firewall settings will allow your device to connect to your printer. Go to the Google® Play app store and add Cloud Print to your device. When you got to settings, Cloud Print will provide you with a list of networked WiFi printers available in your area. Connect with the printer of your choice. Use Gallery to print saved images in Drive, or drop down to “Print” on your browser. When connecting a printer that doesn’t come preinstalled with Cloud Print—what Google calls “Classic” printers—you have options as well. Installing third-party software such as GitHub’s Google Cloud Print connector will bridge the software gap between your device’s operating system and your printer. If your printer isn’t connecting to Cloud Print or producing prints, first check to make sure it’s Cloud Print ready and connected. Many older model printers will have WiFi capability, but won’t come pre-loaded with Cloud Print access (a problem similar to AirPrint). It’s also possible that you may be using an outdated version of Google Chrome, which can prevent your prints from being transferred. 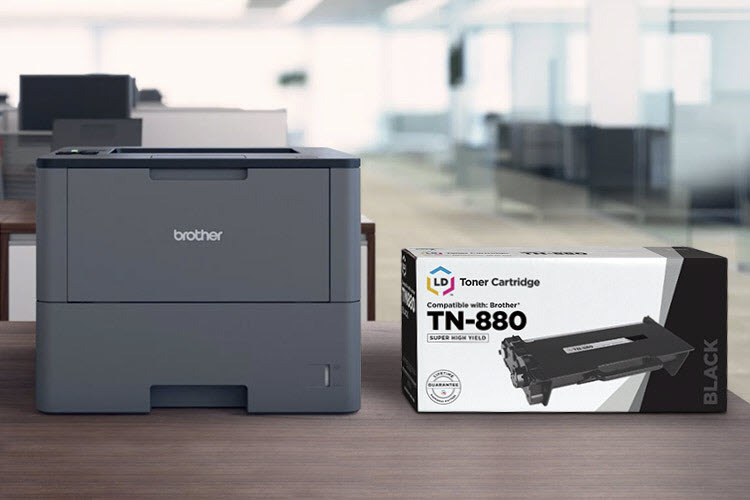 Finally, you may have registered your networked printer twice, which means when you’re selecting a printer you’re actually connecting with it’s ghost twin. Check your networked printers list to make sure you have the right one. Update your printer driver. If your driver is out of date, it won’t network cleanly with more recent versions of Chrome. Logout and log back into your Google Cloud Print connector. Confirm that you’re logged into the same Google Chrome account for both your print management and Google Cloud Print connector. Verify that your printers are installed on the device you’re connecting with the Google Cloud Print connector. Confirm that you’re running the most recent OS. Looking to WiFi printing from your Amazon Kindle? You’re in luck, because Kindle uses Google’s Android operating system, so it’s designed to work with Cloud Print. You can also directly connect Kindle to most wireless printers by finding them on your list of networked printers and selecting print. Like many other devices, Kindle and Android use “Share Page” as the nomenclature that brings you to a print option. Download the app from the Nook App Store. Select your printer. You have several options to help you locate the printer you want, including GPS, keyword search, and a location-based search feature. If you’re having difficulty connecting PrinterOn with your WiFi printers, first confirm that your printer is connected via WiFi where you searched. If your GPS or keyword search don’t send your Nook looking in the right direction, it can get lost. Also, if you are using PrinterOn for business, the app may be password protected to prevent your data from being stolen. To start you will need to have a damp paper towel and a dry paper towel at the ready. Take the warm, damp paper towel and blot the cartridge with the printhead side down onto the towel. The printhead is located on the end of the cartridge where the ink comes out and is typically a gold or copper strip. You should see ink appearing on the paper towel after blotting a couple of times. Be careful not to confuse the printhead with the gold and copper contacts or dots. I know they sound awfully similar…if you don’t see ink you are probably blotting the wrong part of the cartridge! After blotting onto the damp paper towel, hold the cartridge against the dry paper towel for 30 seconds to a minute. This process wicks out any dried ink that may be preventing you from a quality print. Once complete, slide the cartridge back in the machine and run a test print. Often times this does the job quite nicely. If not, repeat the process again. If the second time doesn’t cut it move on to our next tip, printhead cleaning! Only printers with an integrated printhead can use the paper towel method. If you have a printer that uses individual color cartridges, like the Epson® 220 series, the printhead is built into the printer. Most common culprits for a clogged printhead are microscopic dust particles, air bubbles or dried ink. Running a printhead cleaning on your machine will clear the print nozzles of excess or dried up ink. Though the setup might be different for each printer, this is a typical cleaning function built into the printer’s software. Consult your user’s guide to find the cleaning process that will work for you. Print a test page to see if the clog is gone, print a second one to be sure (sometimes two will do the trick). If that does not clear up the issue, stop doing any further cleanings as this use up a lot of ink and running multiple cleanings in a row doesn’t usually render better results than the first. On occasion, your printer will directly call you out for using a third-party ink cartridge. 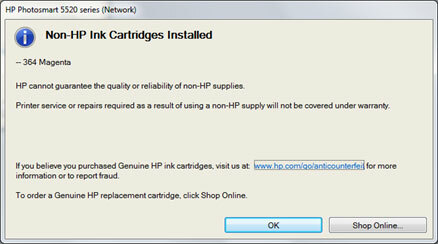 Especially common with HP printers, this kind of message will pop up on your screen, telling you that you’re using a used, refilled, or counterfeit* cartridge, but usually won’t do much else beyond that. 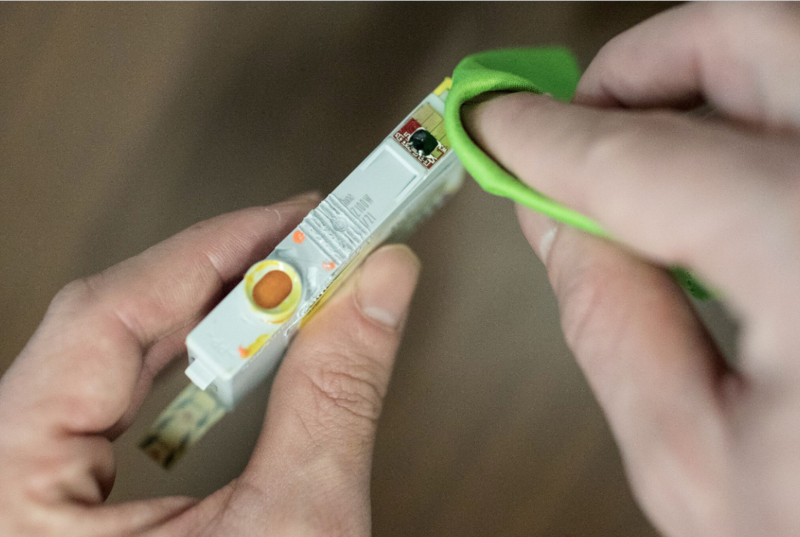 Third-party cartridges usually have chips installed that circumvent this message, but when it does pop up you can easily diffuse it by clicking “okay.” If not, consider removing your cartridge and ensuring the chip is clean, then reinstall and try again. *Counterfeit cartridges are those intended to look like an OEM cartridge. Compatible cartridges that come in their own packaging are not fake contrary to what OEM manufacturers are leading consumers to believe. If you still have your old cartridge on hand, try plugging it back into your unit. Often, your printer will start right back up, and in many instances, you’ll find there was still ink left in the old cartridge! Once the old cartridge is acknowledged by your printer, remove it and replace it with the new cartridge again. Sometimes a quick cartridge swap can convince your printer to accept the new cartridge. Double check to ensure you removed protective seals. New cartridges come sealed at the ink nozzle to prevent the ink inside them from drying out. For some brands, a piece of tape with a tab will create this seal, for others, it’s a plastic piece. 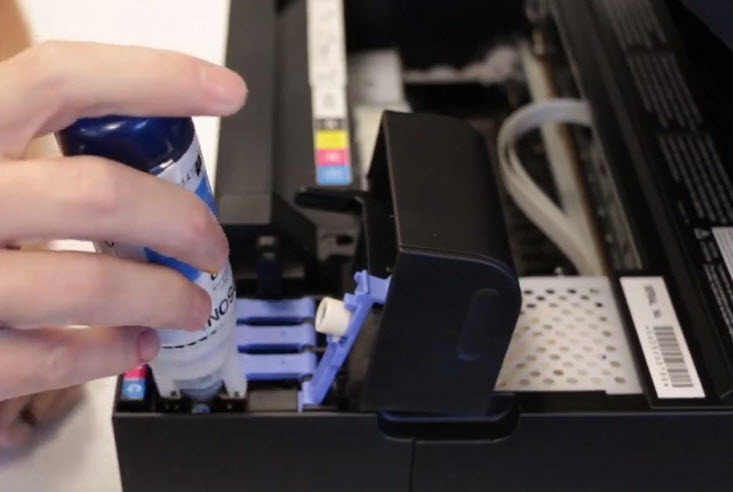 If you try to install a new cartridge into your printer without removing the seal, it may register the cartridge as installed but not allow ink to flow. Check the vent. HP cartridges come with a vent that allows ink to flow smoothly. When this vent is blocked, it can prevent ink from leaving the cartridge. Check on the top back of the cartridge for an orange pull tab, and if this has been removed, you can clear the vent with a pin. Run an extended cleaning cycle. If your printer has been sitting around for a while, the ink resting in the printhead can dry up and clog. Running an extended cleaning cycle will remove any unnecessary ink blockages and get your ink flowing again. If your prints are coming out smeared or extra faint, a cleaning cycle can help fix that as well. Reset cartridge counter. Some printer models feature a cartridge counter that may need updating when you install a fresh cartridge. Epson Stylus printers in particularly have a cartridge counter that can be reset by holding either the “Cleaning” or “Load/Eject” button for three seconds. Check the owners manual to see if there’s a reset cartridge counter option available for your model. Disable low ink messages. Another option is to override your low ink message. Different operating systems and printer models may vary slightly on how you achieve this end, so check your owners manual for specific details. Right click on your desktop screen and click the “All Apps” icon. From there, click the icon that launches the print application for your printer. Here, your options may vary, but click an icon that reads “Configuration,” “Tools” or “Utilities.” From here, you’ll be able to access the Estimated Ink Levels application. This will hopefully update your computer to the ink levels in your cartridges automatically. If not, you can turn off notifications by going into Advanced Settings and enabling “Do Not Show Me Low Ink Level Warnings,” or a similar option, and clicking OK. The problem may not be your computer or your printer at all. Connector cables such as USBs will decay and burn out over time, requiring replacement. Unfortunately, they don’t have indication systems your printer and computer have so that they can die, and you’d never know otherwise. Try swapping your printer out with another cable. Keeping an extra connector cord on hand will help you troubleshoot instantly, and get you printing again faster if your USB is to blame. Modern printers are highly sophisticated devices. Most units today have some form of memory to store print jobs, whether it be a couple of megabytes or several gigs worth in a large office risograph. If your printer is connecting, but printing at such a slow rate it may as well not be, you’ve likely run out of memory. If you’ve cleared each of these options, there is one more: your printer might just be on its last legs. Like all other machines, printers wear down with time, at which point you’re left to consider repairs or to replace your unit. If replacement is your better option, there are a wealth of resources out there to help you select the best new model for your needs. A new printer is an immediate cost, but over time you can save money replacing your old unit with one tailored for your printing habits. However, before you find yourself at store, always try shutting off your printer and computer and turning them back on. It’s ridiculous how many unconquerable problems can be solved this way. Good luck! I ran an update for version 10 and today when I try to print it won’t print it goes to screen where i have to save . This I have done but it still won’t print. I have used LD cartridges for the bes part of a year on my Epson XP830. Today My printer says they are not compatible and will not print. Suggestions. I am sorry you are having trouble with your Epson 410XL cartridges. You might try wiping the contact chip on the bottom of the cartridge with a lint free cloth or Q-tip. Sometimes finger print residue or dust can get on that chip and cause a recognition error. 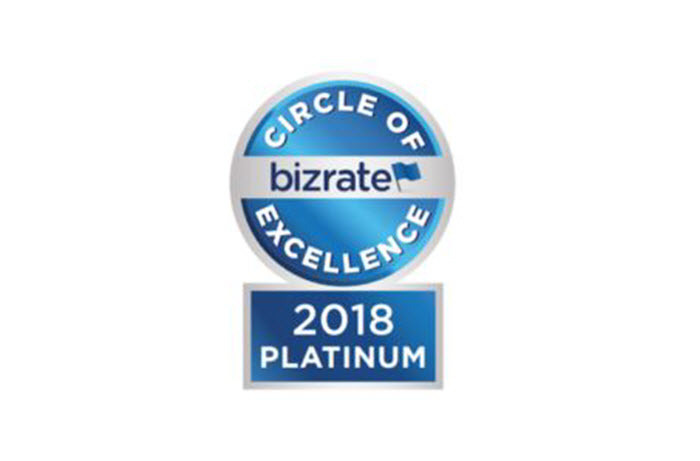 If you still have trouble, please reach out to our customer service team here and we would be happy to send out a replacement cartridge to you. Or team is available Monday – Saturday, 6:00am-6:00pm PST at 888-321-2552. Hope this helps! My HP Envy 4500 keeps showing “Now printing alignment page” but nothing prints. I’ve changed the USB cord twice now and have even bought a new cord. I’ve even unplugged the printer, tried to find an answer on the HP web page, and finally, shut down my computer and then turned it back on. What do I do now? Can you help? Thanks! Magenta ink stopped flowing; I tried cleaning the cartridge, unplugging the HP Officejet 8040 and cleaning the black ink LD cartridge. Now the Cyan isn’t producing any ink, according to the HP Print Quality Diognostic. What do I do now? There are quite a few variables involved, like how often do you print? Are the cartridges full or not empty? Have you tried cleaning the printhead? Here’s an article that might give you some tips on how to clean the printhead. https://www.ldproducts.com/blog/how-to-clean-an-epson-printhead/ The article might be about cleaning an Epson printhead but the process may be theoretically the same for other brands. My Laptop does not send a signal to print when I click on the printer icon of the LP. .( it did before ) How can I correct the problem ? My printer leaves a long black line down the right side of the page. This doesn’t happen when I print from my computer, nor when a page is placed on the glass, but only when I use the feed area. Can you help me? If this happens whenever you use the automatic document feeder to scan or copy something, try cleaning the ADF scanner glass strip. This same sensor is used whenever you scan something from the flatbed AND when you scan with the feeder. We seem to be having a problem with pop ups that are blocking the printer icon? We are not able to print as there is no print icon or word available to print after we hit print. We see the page that is ready but not able to continue the process. I get a printer error message, it says turn power off and then back on again. I do this and the same error message keeps popping up and my printer won’t connect. I have the Artisan 730. I have an Epson Stylus NX420 Series. The printer will copy, but fails to print. i have new ink cartridges in place. The only comment that I see when I try to print refers to the filter. Is it time to replace my printer? Have you tried restarting your printer or reinstalling your printer driver? Try doing one or both of these fixes and let me know if your printer still won’t work. I have an HPOfficejet 6700 that will not scan or fax. Is there anything that I can do before I replace it? Good Morning , i have a challenge , any time i change the ink in my desk jet printer the software on my system will disappear, i will have to re-install it again , how do i get a permanent solution to this issue. I have HP Laser jet 300 MFP . Eversince i turn it on. machine stop working and flashed Error 49. Please let me know what it means and how do I fix it? Here’s what I can find on Error 49 errors on LaserJet models: https://support.hp.com/us-en/document/c05026822. I hope HP’s solution helps get your printer working again! Scroll to the USB controller’s area and click the plus symbol or arrow to open the list.